Radial Lacing Chris King Hubs? I know King says it voids the warranty on the hubs to radial lace them, but I was curious if anyone has laced up a king this way and what the results were. Although it is hard for me to believe that their front hubs are not strong enough to handle the tension, I understand their position that a 2 cross pattern is much stronger and only adds a little weight and aerodynamic drag. More than likely nothing will happen. However when a hub fails from a radial lacing it tears the hub apart along the spoke holes usually ripping a section five or six holes long. there is no sarcasm intended in my post, but how often do hubs fail that way anymore? i have never owned or build up a King hub, but I am curious as this was topic if conversation with a friend of mine over the weekend. I've seen three Dura-Ace hubs with broken flanges, a few other makes and models. Not that many as a percentage but it is a stupid thing to do when you are specifically warned not to. When the entity responsible for the design and manufacture of the hub and therefore the product liability associated with the design emphatically suggests that you don't lace a particular way and even go so far as to void the warranty to underscore the point, why would you go against that for a few grams? Go to the bathroom before you ride and you'll save more. well, we all do things other people do not agree with...we're all reponsible for our actions. i get knocked all the time for drilling through the aluminum stem on my 'cross bike. well, we all do things other people do not agree with...we're all responsible for our actions. That is the key. If you decide to proceed in a way that is not recommended or supported and end up with a failure, the responsibility is yours. Most people look to blame others. Do whatever you want as long as you understand the risks and accept the responsibility for your decision. It sounds like you are just being inquisitive. Nothing wrong there. You all get so beefy with each other. I love it. I asked because I know of several King wheelsets laced up that way and found out about the manufacturer's restrictions on radial lacing while designing new wheels for myself. New DA is radial OK. Phil Wood also, lacem' anyway you want. I see a couple every year. Sometimes I even see hubs designed to be radial laced(wheel chairs) fail. I have owned a set of CK hubs, radially laced front-radial non-drive rear, since 2000. I use them for off road riding and haven't had any issues other than the occasional spoke breaking(usually because of rocks flipping up into the spokes). I wasn't aware back then of any warranty defunctness related to the radial lacing- my mechanic just built them that way, handed them to me, and I said, "Cool!" Hopefully this isn't OT. What advantages, real world, does radial lacing have? When I swapped my Campy Daytona/Ambrossia 32 hole 3 cross wheels for a set of Zondas, I wasn't any faster. My bike certainly did look better though. There is a tiny aero advantage. You save 5-10 grams in weight. The wheel is stronger radial(But less strong torsionally) Easy to build. I guess once in a while is often enough when your the person riding it. 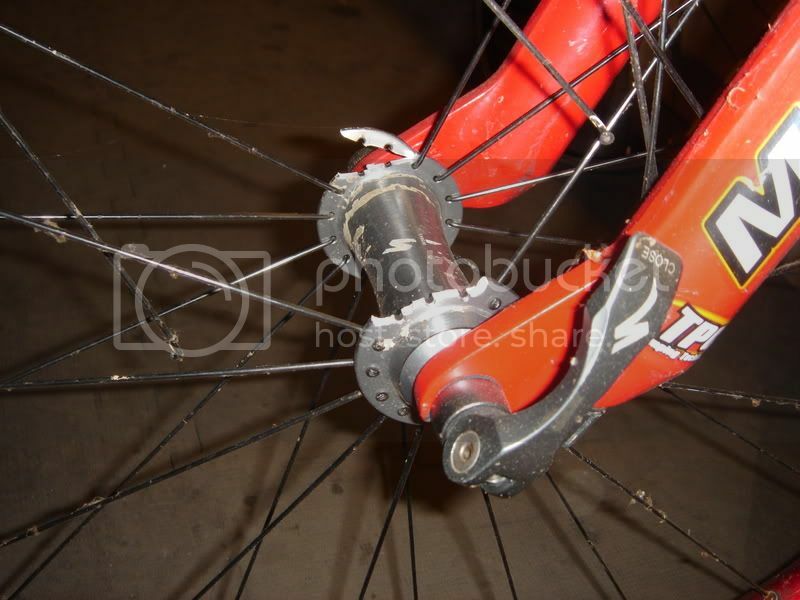 That picture of the specialized hub must have the rim in some sorry state! Bet that happened JRA too, didn't it? A couple of these Specialized hubs have failed while hanging up, according to the owners. However, I wonder about this one because the fork is a little tweeked, like it took a solid shot from the side. Something tells me that't the main reason. CF fork crown race ?